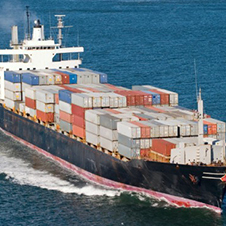 Serck manufacture and supply complete range of charge air coolers for all applications in the Marine industry. Serck have a comprehensive data base of Main Engine Charge Air Coolers featuring all the main manufacturers including B&W, MAN etc. 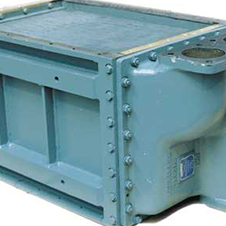 From this data base we can manufacture a complete new unit and have it shipped to wherever your vessel is usually in 3-4 weeks upon confirmation of drawing. 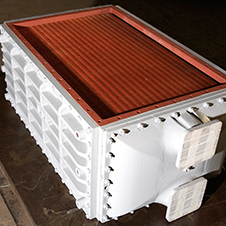 Serck manufacture marine charge air coolers with sizes varying from 3/8” ½”, 5/8” ¾” and 1” with Fin Per Inch from 8 – 20 depending upon the design. We can go on board to take manufacturing drawings of charge air coolers and manufacture as per sample upon taking dimensions in 6 days time. Alternatively, a less expensive option is for us to re-block (Fin and tube element) your cooler utilizing the existing tube sheets and side frame, depending upon the suitability of tube pitch.